When William Mausolf heard Jerry Falwell speak at his home church in Richmond, Virginia, in the late 70s, he liked what the man had to say. And when He learned about Liberty University, he felt the young school was very much like a Christian school should be. He became a member of the 15, 000 Club and for many years did what he could to help "Champions for Christ" attend Liberty University. About 10 years ago, as Bill was studying the scriptures about being a good steward, he came to an important conclusion. He says, "I realized that not only my tithe belonged to the Lord, but also I was responsible for what I did with the other 90%." That is when he started looking into a Charitable Gift Annuity. 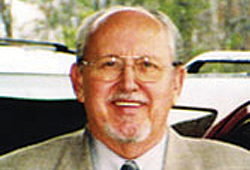 Harold Knowles of the Liberty University Estate Planning Department worked with Bill to build an investment portfolio that benefits Liberty and ensures its future, even as it provides income and tax advantages for Bill today. "The money belongs to the Lord anyway," Bill says. He is honored to be able to give back to the Lord through Liberty University. And we thank the Lord for Bill Mausolf and his obedience to the Lord through his giving! It is with the help of special friends, like Bill Mausolf, that Liberty University will continue to grow in years to come, training champions to impact this world for Jesus Christ.